Here is some experimental data. It's completely taken with "on-board tools" using the XADC, no external filtering. Anybody can repeat the experiment with a patch cable. implies something different. I'm just trying to get you to discuss what I think that you should have mentioned from the start. 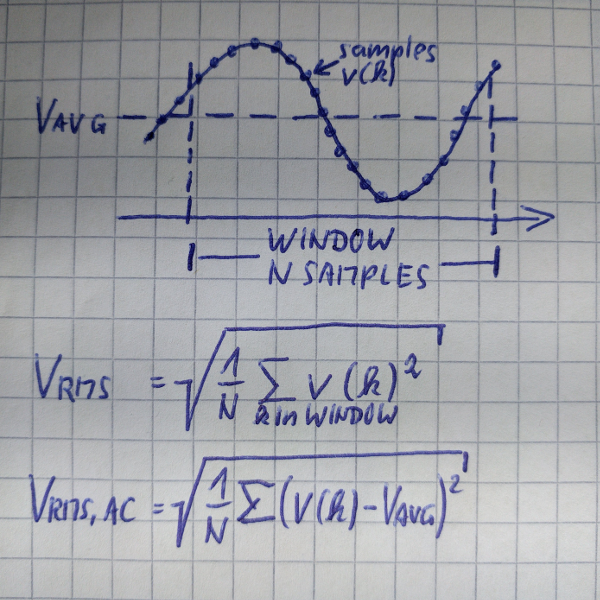 So connecting your "DAC" output to a low bandwidth high input impedance ADC appears to perform one way. Connecting the same pin to any random load might appear to perform quite differently. No doubt you are aware of the discussion on using the PMODAMP2 using a similar approach on a different thread. 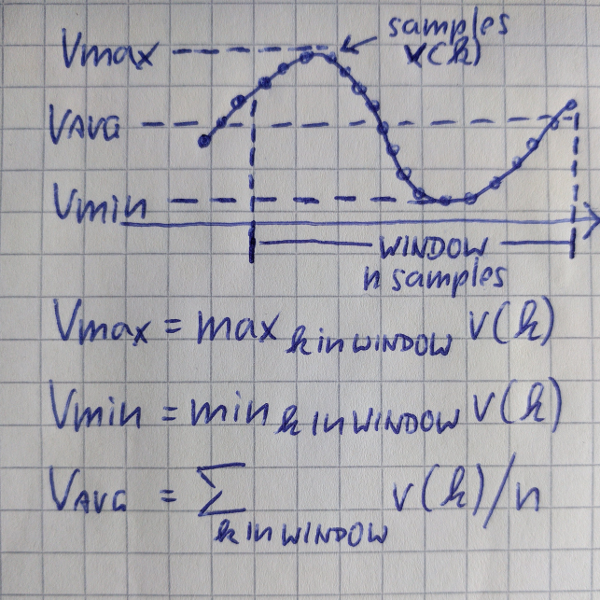 In that case the relevant reconstruction filter and low impedance driver are included in the design. I just think that if you are presenting something for an undefined purpose you should discuss the relevant issues. I'm not one to throw a pocket knife into a crib and say "have fun kid.. and don't hurt yourself"
Of course had you not added the "analog" function generator feature to your tool there would not have been much discussion. Anyone who has had to select a commercial DAC or ADC for a particular purpose has been introduced to the kinds of games that vendors play to sell product that might not be appropriate for that purpose. BTW, my idea of a project for this particular forum is one that the user can modify and learn something from... but the rules aren't clearly stated and there isn't a place for something like this..
On my board, there is a ~50 mV offset to both ADCs. in other words, leaving the input open shows 50 mV. I may add some calibration in the future to get rid of it. Actually quite a bit has happened under the hood. The internal architecture now supports feeding any number of sinks from a FIFO data stream (the ADC connects to both the voltmeter and the file writer). 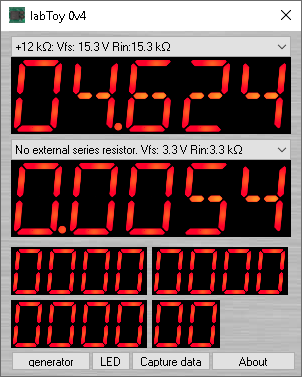 On the surface, only the voltmeter changes. Please note the tooltips! It now implements true moving-average statistics over a 200 ms window. This particular length suppresses both 50 Hz and 60 Hz power line hum, and responds still near-instantaneously. The screen refresh rate is actually higher than the window length, the two are independent. 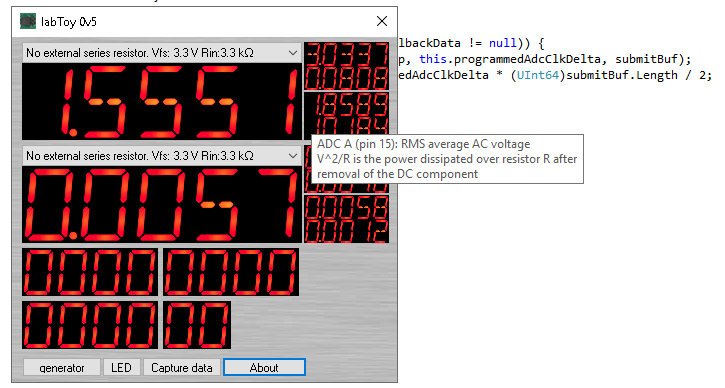 PS: For best results with the voltmeter, set a high ADC sample rate e.g. 720000 in the "capture" window. CPU load goes up, but so does bandwidth.